Exclusive Deadpool Slurpee cups, straws, and other products available now only at 7-Eleven. America’s favorite anti-hero is taking over 7-Eleven stores nationwide starting on May 7th. 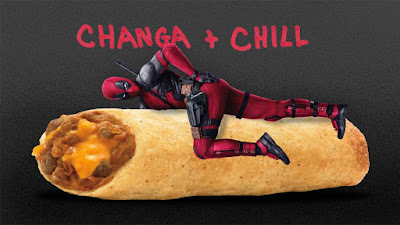 Deadpool will come to stores through a first-of-its-kind augmented reality (AR) in-store experience, movie ticket prizes, and exclusive Deadpool-themed products (chimichangas included). Deadpool and Marvel fans alike can collect or devour exclusive Deadpool-branded items that range from collectible Slurpee® cups and straws to mini and monster chimichanga’s, Trolli Sour Brite Tiny Hands candy and the Funko POP! Deadpool figurine that can only be found at 7-Eleven stores. chance to win prizes including movie tickets, a trip to Las Vegas and more.